Work hard and play harder—that’s what it means to be an athlete. Whether you practice or play every day for your school team, or you’re a “weekend warrior” with Saturdays full of basketball or tennis, you need to take extra care of your feet and ankles to stay in the game. When you run, the force on your feet with each step can be quadruple your body weight—or higher! Furthermore, you need sturdy ankles that can leap, land, cut, and pivot. The pressure and stresses on your feet and ankles can be enormous, but with the right precautions and equipment you can greatly reduce your risk of injury. And if you do get hurt, seeking treatment immediately will help you get back in the game faster, with less risk of developing chronic problems. Avoid overloading your feet with high-impact activity. If you run or play basketball every single day, they never get a chance to rest and recover. Instead, cross-train in multiple different sports and activities, and give your feet a break by going for a long bike ride or swim instead of another run. Ease into new activities slowly. Sudden shifts in training routine or dramatic increases in mileage or intensity often lead to pain and injury. Shoot for 10%-15% increases, at most, on a week-to-week basis. Stretching and strength training for your legs, feet, and ankles helps keep them strong, limber, and flexible—all of which both improve athletic performance and prevent injury. Wear comfortable, supportive footwear that is appropriate for your sport, and use orthotics if you need them. From cleats for the soccer field or gridiron to court shoes for basketball to ballet slippers for dancing, each activity requires its own set of specialized gear. Wearing the wrong shoes for your activity, even if they fit your feet, can be counterproductive—and wearing shoes that don’t fit at all can be a disaster. Always get your feet measured and sized correctly before you go shoe shopping, even if you think you know your size—feet continue to change shape throughout a lifetime. It’s also a good idea to visit later in the day, when feet are a little swollen. Your fit with shoes and socks is also different, so be sure to wear the same type of athletic socks you’ll be using when you play. That way, you can find a good fit under normal conditions. Toes should be able to wiggle and lay flat in the toe box without restriction, with about half an inch of room from the front of the shoe. Heels should fit firmly enough not to slip, but not so tight that it pinches. Good arch support is another non-negotiable. 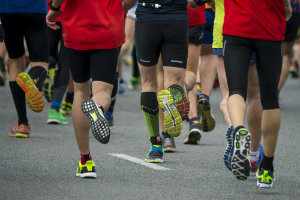 A specialty running or sports shoe store will often be able to help you pick the right style for your activity and foot shape. The team at Absolute Foot Care Specialists can also perform an evaluation and gait analysis to help you find the perfect pair. Feet come in all sizes and shapes, and unfortunately that means they aren’t all equally good at distributing weight or cushioning impact forces. Athletes are no exception to this variation, which is why many can benefit from using custom orthotics. Like “ordinary” custom orthotics that you would use for daily activities, sports orthotics help you eliminate foot pain and prevent injury by accommodating or correcting biomechanical flaws in your feet and ankles. However, they also take your specific athletic needs into account. They can be optimized for your athletic shoes, built tougher to handle the rigors of competition, and provide specialized protection that can help you avoid the most common risks and injuries of your chosen sport. Of course, they’ll also help you train longer and harder without pain, and improve your performance on the field, too. 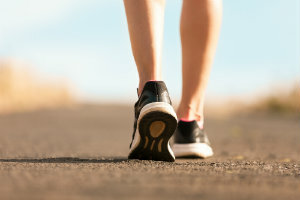 Our Southern Nevada Heel Pain Center can help you with orthotics or other treatments to take care of lingering pain. When your feet hurt, your body is trying to send you a very important message—something is broken, and you need to fix it! We know that athletes are supposed to be tough, and that no one likes having to come off the field. As long as they can still stand, many people would choose to push through the pain rather than leave the game. However, this is usually how the worst injuries with the longest recovery times and highest complications risks occur. The podiatrists at Absolute Foot Care Specialists understand that you work hard. Don’t miss out on playing time due to foot and ankle pain. Dr. Levine is on your side. Focusing on conservative treatment, we’ll help you find the solution for your foot pain problem. Contact one of our Las Vegas offices today to schedule an appointment or complete the online request form. For more information on specific foot and ankle injuries, check out the links below.